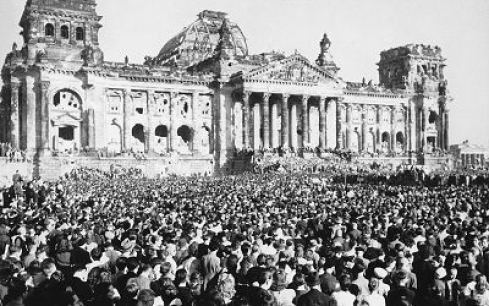 Beginning in April 1948, the USSR blocked Western Allies’ access to Berlin as a means of protesting the introduction of the Deutschmark in West Berlin. Following WWII, Berlin had been divided amongst the Allied nations, with France, Great Britain, and the United States taking claim of the West, and the Soviets controlling the East. However, the erstwhile Allies now disputed the future of the city: specifically, whether a capitalist democracy or a Communist society should be instituted. The introduction of the Deutschmark served as a symbol for these differing core beliefs, and the Soviets threatened to restrict access to Berlin until the Western Allies revoked the currency. 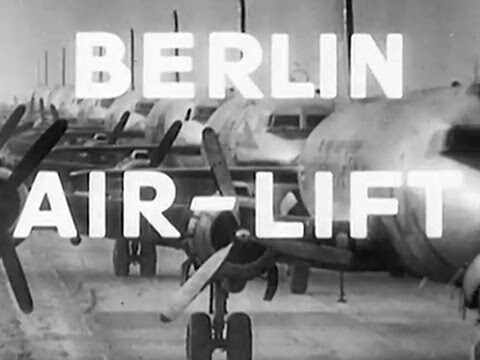 In response, the Western Allies began an airlift on June 26, 1948, flying in supplies with military aircraft to support the entire population of two and a half million Berliners. 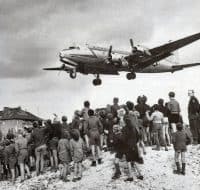 The blockade lasted much longer than anyone had initially expected; it was not until over a year later, when it was clear that the airlift was a success, that the Soviets eventually backed down. 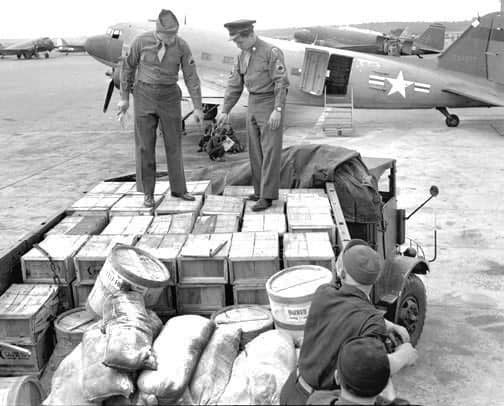 More supplies had been flown into Berlin than had previously been supplied by rail, proving the American’s commitment to Berlin in this first crisis of the Cold War. Thomas J. Dunnigan served as a political officer in Berlin during the blockade, and recounted his experiences there in an interview with Charles Stuart Kennedy in September 1990. Dunnigan interviewed Karl F. Mautner in May 1993, who remembered the demonstration held to protest the blockade, and Dr. William Lloyd Stearman, interviewed by Kennedy in April 1992, describes how the blockade could have been broken with ground forces rather than an airlift. Read about the construction of the Berlin Wall. Go here to read about JFK’s famous “Ich bin ein Berliner” speech and the tense negotiations behind the 1961 Berlin Crisis. You can read other Moments on the Cold War. DUNNIGAN: The blockade started on the 24th of June 1948, and lasted until the 12th of May ’49…. We maintained, outwardly, that Berlin was a four-power city and that we, as a member of the occupying powers, could go anywhere we wanted within the city. We could not go outside the city into the Soviet zone except on one road that linked us to the West. That was the autobahn that went [through Helmstedt]…. We could go by train either to Frankfurt or to Bremerhaven, but we could not go outside the city in any other direction. But we deliberately went into the Soviet sector of Berlin, as it was called, frequently. In fact, they had the best opera there. And we would drive around, just to be seen, in American cars and so forth. We didn’t want the Russians to say they had sort of shut us out of there, or frightened us out. And in those days you could take the subway or the elevated train across. There was no problem, just right in the city. Now it began to get a little dicey in April of ’48. The Russians had walked out of the Control Council, the main governing body for governing Germany. Marshal [Vassily] Sadolovsky [a Soviet military commander] had walked out at the end of March ’48 over a dispute, as I recall, about currency reform, because the Russians didn’t want any. The Western powers had said, “Look, nothing will ever get this country off its back unless they have a solid currency.” Well, there was a to-do about that, and Sadolovsky walked out and never came back. Then about four weeks later a British plane coming into Berlin was, as I recall, shot down by the Russians, who said it had strayed out of the air corridor (which was nonsense) and crashed. And this told us they were ready to play hardball. They stopped the trains from Helmstedt around that period, on the pretext that the bridge across the River Elbe needed repair and would be closed for some time. So the noose was tightening. We still had the autobahn to drive back and forth; but they could have at any time said the autobahn bridge needed repair. I think it was on the 21st of June that we declared currency reform for West Germany and West Berlin. The Russians then declared a blockade on the 24th, and we started the airlift on the 26th. We didn’t know how long it would last. We kept getting reports from Ambassador Bedell Smith in Moscow. He’d have conversations, including those with Stalin about this, and Stalin would sort of grunt or nod and say, yes, he thought something could be worked out, but, you know, it never was. Dependents who were there (and I didn’t have any at that time) were offered an opportunity to leave. And very few left; most wanted to stay. They wanted to ride it out and not leave the Russians with the feeling they’d forced us out. The situation didn’t get questionable until the fall. The airlift worked fairly well in the early months, and there had been enough supplies there to last, but it soon became evident that the two great needs over the winter were going to be coal and potatoes. So the planes began to bring those in. We started out using C-47s [a two-engine military transport aircraft]. While they were state of the art in some ways in those days, they weren’t very big…. Later, within a few months, we began to get C-54s [four-engine transport aircraft]…. General Tunnel, a lieutenant general in the Air Force who was brought from the States and put in charge of the airlift, commandeered almost every C-54 in the world and brought it to Frankfurt. So, with the C-54s, they could bring a lot more in. Still, you were going to feed a city of two and a half million people, and it wasn’t at all sure whether we could make it through the winter. The worst time of all came in November, because, for about ten days in a row, there was heavy fog and planes couldn’t get in. We didn’t have the sophisticated radar or landing guidance equipment we have now; it was very primitive. And also, most of the time, we were using Tempelhof Airport, which is right in the city of Berlin and wasn’t really built for very large planes. It took some skill. Later, we built a new airport with the French and the British, Tegel Airport, a much larger airport. But that wasn’t completed until February or March. So, in November, we were still using Tempelhof, in our sector, and Gatau, a smaller airport, in the British sector, and the British were bringing in their share of material, too. Now the feeling was that if that fog had persisted for another month or so, we might have been done in. But, fortunately, after about ten days, it lifted enough for the planes to start getting back in. And it was amazing to see them come and go…land, unload, and be gone in ninety seconds–incredible! [The airlift] certainly solidified the relations with the Germans in Berlin, because there was a feeling: We’re all in this together. Now we, as occupiers, lived much better than they did. We still were getting PX [Post Exchange] supplies, although when electricity went off, as it did, we didn’t have any electricity, things of that nature. We were given five gallons, as I recall, of gasoline a month for our cars, so everybody was carpooling when they used a car in those days. I had a bicycle along with my car, and I used that a great deal during the blockade. It got to be a stick-it-out thing, everybody saying, “By God, we’re just not going to let them do this to us!” And we did it…. We were always aware that [a military threat] was there. The Russians, in my recollection, never particularly threatened that. They didn’t threaten to come in. There didn’t seem to be any large movement of their forces that would indicate they were planning something. All three powers had garrisons in Berlin, small, they would have been overrun, but it would have been a pretty stiff fight for a few days. And the Germans would have sabotaged everything the Russians did anyhow; they hated them at the time. No, it solidified our relations with the West Germans. Because, for instance, in the airlift, all of the manual labor was being done by Germans at the airport, unloading that coal, unloading the potatoes, telling the plane when it could move out again. All of that was done by them, and pretty soon the spirit of cooperation replaced that of sort of occupier vs. occupied. It was very good in that respect…. We still went into the Soviet sector. They never stopped us. They had thrown the city government of all Berlin out of East Berlin, but we wouldn’t let them stop us going there. Although, just because of the lack of gasoline, we probably never went there as often. We could go by subway, though — when the subway worked, but, again, you had power shortages…. The East Germans, of course, were not directly affected by the blockade. Their level had been perhaps close to that of the West Berliners before the blockade — bad for both of them really. But with the introduction of the new currency reform in West Berlin, prices meant something. Items began to have value again. West Germans had things that East Germans could only admire. So gradually, gradually, there became a cleft between the two that grew wider over the years and ended, as we know now, with tearing the Wall down. Q: On September 9, 1948, there was a big demonstration against the blockade. What was your feeling at that time? Could the Berliners stick it out? Did you feel that this demonstration showed that the Berliners were willing to suffer and carry on their life during the blockade? MAUTNER: Yes. That’s a little bit of a leading question, but I am quite sure that was the case, because the demonstrators wanted to show that the Berliners led by Ernst Reuter [German mayor of West Berlin] did not want the currency issue to become a vehicle for turning them over to the East. They wanted to show the Allied authorities that they were willing to hold out even though the coming winter would mean hardships, and that they trusted the airlift and the Western Allies, especially the Americans. They then endorsed a document which asserted that Berlin was prepared to hold out, no matter how tough the times, and marched to the nearby Control Council to present it. Their action stiffened the backs of the three Western allies against any sellout of Berlin. It was a very decisive moment I am convinced. STEARMAN: About the time of the excommunication of [Josip Broz] Tito [the fiercely independent Communist leader of Yugoslavia who defied Stalin], the Soviets began the full imposition of the Berlin blockade, which had started piecemeal six months earlier. There is an interesting little sidelight to this. As you know, there has been a long standing debate as to whether the blockade could have been broken with ground forces. [The General in charge of the U.S. Occupation Zone in Germany Lucius D.] Clay wanted to go in with tanks before we resorted to an airlift. [President Harry S] Truman ruled this out; however, Clay may have been proven right by an interesting little incident that occurred in 1948 on the border between the British and Soviet Zones of Austria. Just before the Berlin blockade, the Soviets began imposing new restrictions on British troop transit from their zone in southern Austria to Vienna. The Soviets insisted on IDs with photographs, which apparently the British didn’t have. So they started to prevent the British from going up to Vienna. 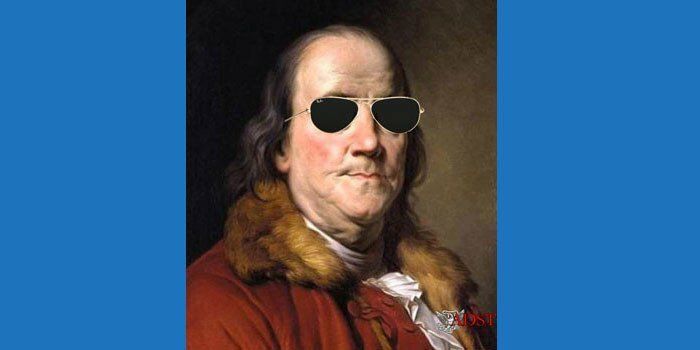 I believe they were going to see if the Brits could be intimidated, and if so, they would later try it with the Americans. Anyway, that is my conjecture. The first time they were challenged by the Soviets, the British turned back. The second time, however, they came up with a long convoy of troops in battle dress and tin hats, to the Soviet barrier with the British captain in charge in the cab of the lead truck. Again the Soviets raised the identification issue and refused to let them through. The captain then came out to the side of the column and commanded, “Fix bayonets!” and all up and down the line there was the click, click of bayonets being fixed to rifles. Then he walked up to the Soviet barrier, lifted it, and the convoy went through without further incident. That was the last time the Soviets tried to block a British convoy. This incident tends to lead one to believe that if we had tried that on the ground in Germany, we probably could have gotten away with it. One has to bear in mind that we did not know, in 1948, how weak the Soviets were or the extent to which they had been bled white in the war. We did not yet know the extent of the vast destruction in the USSR. We had, for example, only a very vague idea of how many people in the Soviet Union were killed because at that time the official Soviet figure was something between 6 and 8 million. The latest figure is now 28 million killed…. We just had no idea how reluctant [the Soviets] were to get into any war. Had we known in 1948 how badly the Soviets had been bled in World War II, and had we somewhat more troops at our disposal, I think history might have been quite different. All of this was going on in 1948 and, of course, so was the Berlin airlift which I and nearly everybody else thought wouldn’t work. Feed 2,250,000 Berliners by air? You have to be kidding? We had only those C-47 “goonie birds” in those days. They started bringing those in [C-54s] later, but we started off with the C-47s. The Air Force was very reluctant to get involved in an airlift, because they didn’t want to tie up most of their transport aircraft, which also had to have fighter escorts available in case anything happened. It was to everyone’s amazement that it worked. That set the Soviets back quite a bit in terms of prestige.